President Barack Obama Tuesday night set forth his ambitious vision for the future of the U.S., but conceded his failure to heal the divisions politically that are holding back progress, calling it the lasting disappointment of his time in office. 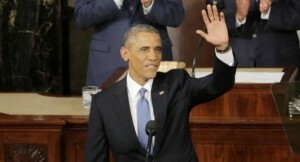 In a speech broadcast in primetime that avoided the usual list of policy prescription, Obama used his last State of the Union address to emit an image of the nation following his leadership the past seven years. He mentioned an economy that is growing and a better standing in the world despite the inequality that remains at home and the terrorism that continues abroad. However, for Obama, who campaigned for the White House on a promise of change and hope, and vowed when taking office to transform politics itself including Washington, accepted the responsibility for not reaching his goal. He said that one of his few regrets during his presidency has been the suspicion and rancor between the two parties is worse and not better. He added that a president who had the gifts of Roosevelt or Lincoln might have been able to bridge that divide. He also acknowledged that many people in the U.S. are frightened and feel shut out of economic and political systems they look at as rigged against their own interests. He sought to contrast repeatedly the bleak appraisals of the Republicans of the state of the country with his upbeat assessment. The President called the version of his opponents fiction and defended the decisions he has made, many of them flash points for the huge partisan divide. The President also singled out GOP presidential candidate Donald Trump for criticism saying Americans need to resist calls to stigmatize every Muslim during a time of many threats from ISIS. Obama made an indirect yet derisive reference to Senator Ted Cruz another GOP presidential contender who criticized the foreign policy of Obama and urged him to carpet bomb ISIS. He also spoke with humor and appeared relieved that the speech did not continue the usual list of legislative proposals.